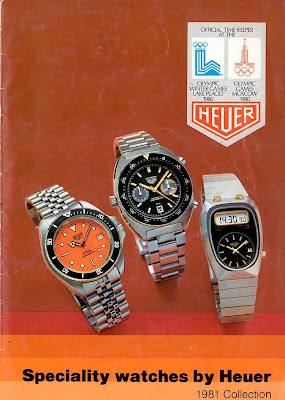 This is my favorite vintage Heuer diver. 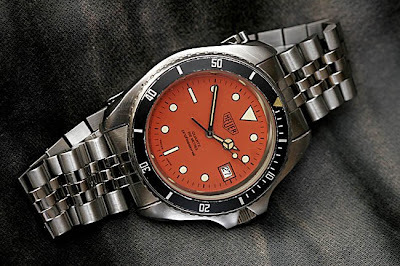 The bright orange dial is just very cool. And the big full size 42mm case makes this a very visible watch thats get a lot of comments when you wear it. As you ca see on the picture above, the writing on the dial is a mix of English and French. On the French made ref. 844 (http://classicheuers.blogspot.com/2009/01/heuer-844-french-made-diver.html) all text is in French: 200 METRES / Professionel. On this Swiss Made watch the print on the dial says: 200 METRES / Professional. The depth rate is still French, but professional is now in English.. 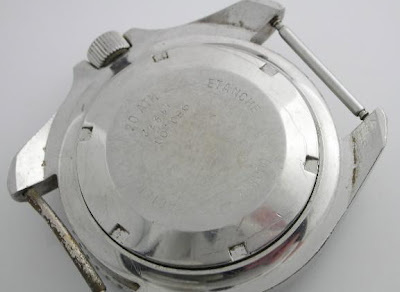 The movement on these early diver is ESA 536.121. This is a quite fragile movement, and it's very common to see non working examples of these diver for sale on Ebay. The can often be picked up very cheap. But be avare, it's very difficult to find parts for this movement. Even a used replacement can be very difficult to find. If your movement fails, and you don't have a spare or the parts needed I got the solution for you. A automatic ETA 2824 is a straith fit. The base is the same, so the hands, dial and stem will fit. If you are a little handy, you can do the swap yourself in no time. I have done it without problems. 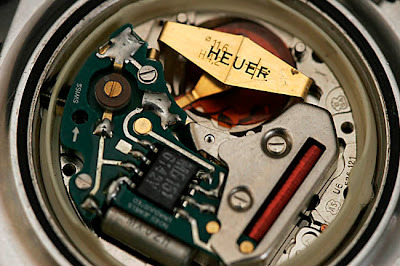 The caseback is just plain, without the HEUER shield logo. They are stamped with ref.number and serial number. 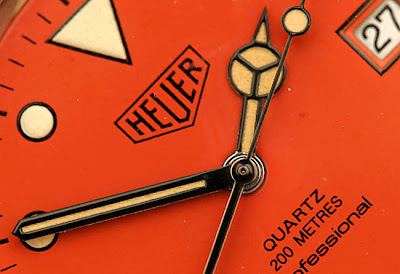 Later Heuer divers have more well made case backs with the HEUER logo in the middle. The screw in crown is unsigned. I love this watch as well. One of the top, "I want to find one" watches along with it's baby brother the 980.014. One little niggle though. Metres is spelled correctly. Metre is preferred among the majority of countries in the English-speaking world except in the United States, where the spelling is meter.